I have become so regularly irregular not only in blogging but in all activities. I was not able to streamline activities over the last few months. Now I am on serious mission to be back with my disciplined activities. I had made up mind to post only after I have become disciplined in all respects. 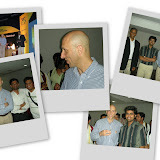 Last month I had a great oppurtunity to meet the PL/SQL guru Steven Feuerstein in person. I also did not miss the oppurtunity to listen to his Best Practices PL/SQL seminar. He was just performing magic with nothing but PL/SQL in front of hundreds of PL/SQL developers. I also had a chance to speak with Quest Softwares Krishnan Thiagarajan, Managing Director for Quest Softwares Asia Pacific region.